Hello and welcome to my tutorial page, in here you will find very useful tutorials to get you started and more. Also, If you are interested in accelerating your learning curve in iclone i also have a bundle pack that covers modeling, texturing, lighting, and basic animation for $50. which also includes an extra introduction class scifi edition style as a bonus. That is 13.5 hours of training! Enjoy! Free introduction to iclone 4 part 2 (texturing) from Stuckon3d on Vimeo. Iclone4 Introduction from Stuckon3d on Vimeo. Introduction to iclone 4 part3 (lighting) from Stuckon3d on Vimeo. This was part one of the intro, part two will be coming soon. Enjoy! tell you the letter for the hot key. While anyone can become a master of all RL softwares/tools with enough practice, not everyone is classified as an artist because they mastered them. And that is what Iclone is, a tool, a tool to help you express your visions. 1) In modeling, i will teach you to push a model to its limit without making it heavy. I will show you what can be done texturally without having to model it. 2) In texturing, I will show you how different material behave in real life and show you how to recreate them in the Iclone world. 3) In lighting, I will teach the basic principles and them show you how to translate that with Iclone lights, IBL,HDRI, and tone mapping. Well I think you get the point by now. I'm going to teach iclone from an artist point of view, because anyone can teach you that 2+2=4, but an artist can also show you how if you turn a four upsidedown you can use it as a chair in iclone. I have worked on two major TV series ("Star Trek : Voyager" and "Deep Space nine"). Also worked for Disney, Nickelodeon, and Electronic Arts as a senior artist and an Art Director. I've also done movie trailers and music videos, as well as worked on six animated feature films. So if you ask yourself, does this guy have any experience? Does he know what he is talking about? well what do you think. Just send me a private message letting me know which class you are interested in. 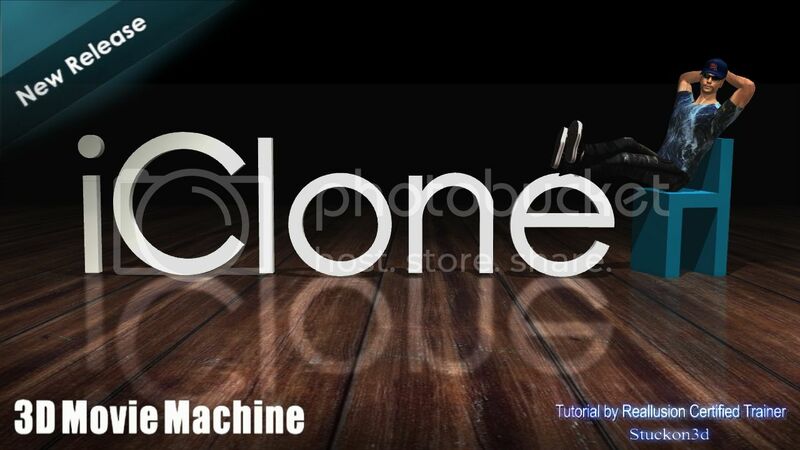 Anyone who would like to learn Iclone's workflow for creating a shot. Anyone that wants to learn to move around the GUI so that it does not get in the way of your creativity. Anyone that would like to pick up some cool tips and tricks. 1) do not let the word introduction to iclone fool you. While the class is targeted at the beginner there are tips and trick even the pros can use. 2) Free does not mean barely useful information. In this class there is so much useful information about all the areas of iclone, that I really recommended that you write everything down. Yes, there is that much. "in some circles i am considered an iclone 'expert' but i gotta tell you i learned a lot from the this class - chris has an easy way of teaching that helps you retain the pointers - and lotsa pointers was shared"
"This class was really helpful - there are so many little shortcuts and functions I knew nothing about. Thanks so much and I highly recommend these classes." "Highly recommend everyone to give at least the intro a look see. Lots of good advice and how to's for the investment of some of your time." "Thanks a lot, This class was exactly what I needed to get started..."
"Good tips and definitely worth the time. Thanks"
"Great class. The use of hot keys is a big help. It was very nice that you repeated yourself on the importent spots. This is how it should be done. Big Aplause. " "I loved the intro class on iclone 4. Very well done and learned a lot of things. Shortcuts were specially helpfull. Thanks. I will probably sign up for your next classes...i believe it´s money well spent if you´re serious into learning this great tool. Congratulations Stuckon for your time and thanks for the extra half hour of teaching." With recommendations like this, how can you go wrong? So dont be shy, even if you are an intermediate user, i can assure you will get something out of the class. I'm doing this for anyone that wants to get moving in iclone, even if you dont take any of the other classes, I really dont mind you joining, there is zero obligation or expectation of further commitment. I'm also doing this for the people that do want to further their skills by taking my other classes, because once they see me zipping around the GUI the might wander how im doing that. And that is another reason why im giving this class as well. PS: feedback is always welcomed. Count me in. do i need to PM you, or this is just enough? Thanks a lot. I´m looking forward for your class. Yup just PM me with your email address and I'll send you the link tonight. Welcome to the class. PS: only 14 seats left now. How long will this class be? the class will be one hour plus 30 minutes of questions and answers. stuckon3d, can ou confirm you received my PM? For some reason after i sent it, it doesn´t appear at the sent items...strange. Is this normal? Is there any way it could be recorded somehow? I would love to see it when i am awake. Timezones are not always friendly you know. Its a very very good idear you got there. recordings are allowed at your own risk if you know how to do them, however it will be for the individual's personal use only, any posting of my class on the net or sharing with others would be illegal. However, if enough people from your timezone are available, I could set up a second class during the day that will suit people from opposite timezones. So tell me, when its 1pm here in california, what time is it in your neck of the woods? I'm a total night owl so I would not mind giving a class at 11pm my time if this helps alot of people out there. yup I got it! Thanks. 12 seats left and counting.